The first Okoa Refuge Bible School ran from May 2011 - May 2013 with 45 men and women graduates. Since then, 26 more classes have graduated and 28 are currently running. So far, 520 men and women have graduated from the intensive program. The school meets one week each month for 24 consecutive months. People travel from their homes to come and spend an intense week learning the truth behind the Scripture. Okoa ensures that every student has his or her own text book and a qualified teacher to teach the class. Students are responsible for their own meals, accommodations and transportation. The students also provide for the needs of the teacher. You have the incredibly amazing, wonderful and unique opportunity to fully or partially sponsor a Bible School. This means that YOU can be responsible for 20 men and women receiving the opportunity to learn the Bible, learn how to Biblically lead and how to effectively communicate! It's only $150/month to sponsor an entire school! That's the best deal you will find anywhere! Okoa Bible Schools use a curriculum developed by Harvest Time International. Okoa has translated the curriculum into four different languages in order for students to be able to learn in their own native tongues. The goal for every Bible School student is for he/she to graduate equipped to be a minister of the Gospel. For some this means returning to the workplace; others return to the churches where they were already pastoring. Some graduate and plant new churches. The fourth group of people will become full time missionaries. Regardless of the path one takes after graduation, each and every student is equipped and encouraged to begin sharing the Gospel with and discipling his/her community. Okoa Refuge believes that every church should have a qualified pastor. However, attending an accredited Bible College or Seminary is not an option for many rural pastors. Okoa believes that this should not stop them from being able to learn the Bible and grow in their leadership and faith. Unfortunately, lack of training is the very thing that has led so many pastors away from the Lord. That is one of the reasons the Okoa Refuge Bible School program was started - to produce pastors! Since 2016, Okoa has planted 50 churches. All pastors have graduated from a two year Okoa Refuge Bible School. They are trained and ready to lead others! At least three church plants have gone on to plant churches out of their congregations. It has truly become a movement of God in Uganda! Churches planted by Okoa are not governed by Okoa, however. 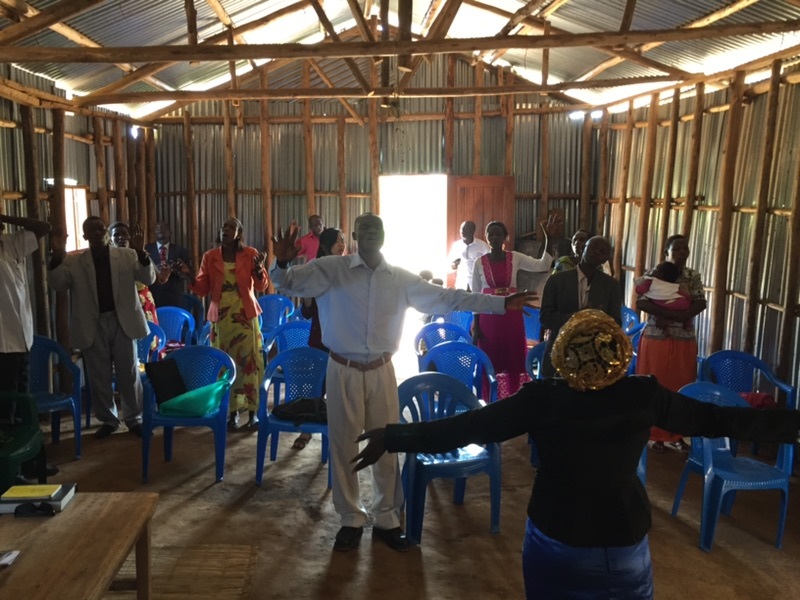 Churches are planted under established church associations that Okoa has helped to start. These indigenous associations provide Biblical oversight and accountability to the operations of the church. "DBS" stands for Discovery Bible Study. The DBS model is a participant-led discover journey into learning and understanding what the Bible teaches. The DBS is the way into a community and truly guides people through the Gospel! Every planted church starts as a DBS that is led by a Bible School student. Once the group reaches at least 20 adult members, they can apply to receive a church structure. Once the graduate's DBS group qualifies, Okoa comes alongside and supports the construction of a church! The church is not constructed by Okoa, alone, however. Before Okoa will come in, the church members are required to provide the land for construction. Okoa provides the pole structure, the roofing material and the labor. The congregants must also agree to finish the walls of the building within one year of the completion of the structure. This way, the church has some ownership of their building! The total cost to construct a church, send the pastor through Bible school and buy 25 Bibles for the congregation is only $3,000! Join us in part or in whole as we partner with the Lord to plant churches that stand firm upon the Bible! If you are a pastor - or a layperson with specific training - and feel the pull to come and teach our pastors, we would love to talk with you! Okoa hosts two pastor conferences each year. Typically they are held in March and October, but dates can shift depending on the growing season. Please click the link below, fill out the short form and someone will be in touch!